Making traditional foods linked to that particular occasion(festival) is always satisfying and heart filling.Those days only authentic trademark dishes were done as neiveidyam. Nowadays at many homes some innovative dishes also are made.One such recipe is choco modak,its modern at the same time a beautiful exotic dish to endeavor.This time additionally along with normal poorana kozhukattai/modak am filling my cute little Vinayaka/Ganesh hands with Chocolate stuffed modaks. At first I was not having an idea to make the filling,later thought it will turn out well and gave it a try.We are going to heat up chocolate in direct flame so be careful not to burn the chocolates.Total only four ingredients needed for this sweet even any essence or flavorings are not needed.This choco modak was very simple to make with gorgeous white chocolate filling.You can use paneer instead of desiccated coconut.The coconut choco combination worked out very well with mild nutty sweetness from the coconut. 1.Heat a kadai add desiccated coconut and stir for a minute then add chocolate. 2.When you add chocolate lower the flame. 3.Now add condensed milk stir for few minutes till all comes together. 5.When warm take the modak mold stuff this dark chocolate mix into it. 6.Press in the center(make depression). 7.Fill in the white grated chocolate. 8.Then again take a ball of dark chocolate mix close and press. 9.Open the mold and the chocolate modak is all done. Heat a kadai add desiccated coconut and stir for a minute then add chocolate. When you add chocolate lower the flame. Now add condensed milk stir for few minutes till all comes together. When warm take the modak mold stuff this dark chocolate mix into it. Press in the center(make depression). Fill in the white grated chocolate. Then again take a ball of dark chocolate mix close and press. Open the mold and the chocolate modak is all done. If you are not interested to stuff white chocolate just make simple modak with dark chocolate alone. My dark chocolate was mildly sweet so,have used condensed milk alone and no sugar was needed. White chocolate stuffing was also sweet enough and well balanced with the outer covering. Wow!! Kids friendly modak!! Yummy!! Haha!! I love the concept so much! my little Ganesha will love these modaks for sure! 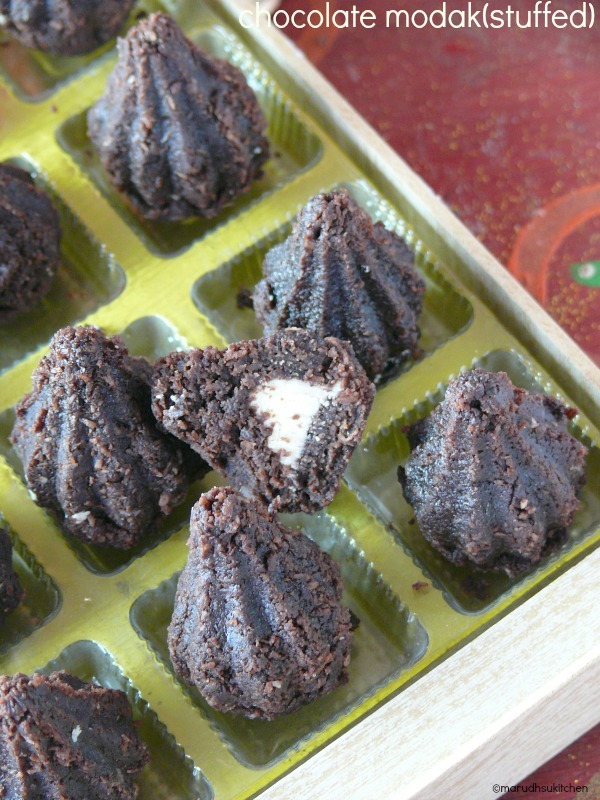 First time to your blog,like your choco modak very much real twist from regular ones.